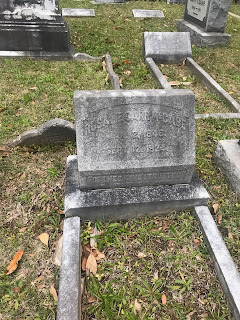 These first four epitaphs I found are all from the cemetery that belonged to Hoopers Creek Baptist Church. 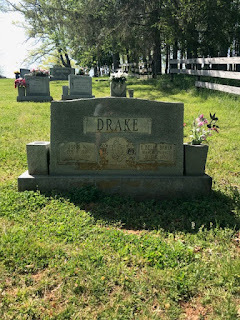 This first die on socket belongs to John W. Blake and E Belle Baker Drake. It says, "Our Father Which Art in Heaven." This is a part of the Lord's Prayer which signifies that they are most likely very religious. This next tombstone belongs to John and Martha Louise Lanning. On the bottom of the die on socket marker it says, "We stroll across heaven together." I think this is very sweet considering these two were married, died, and explain that they walk in heaven together. They must have really been in love! 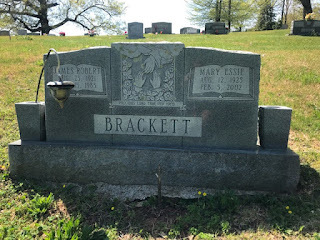 Another grave that has an epitaph is the Brackett grave. This die on socket belongs to James Robert Brackett and Mary Essie Brackett. It has a picture of two hands reaching to the heavens for God's hand. Then, beneath the photo it says, "Precious Lord Take my Hand." 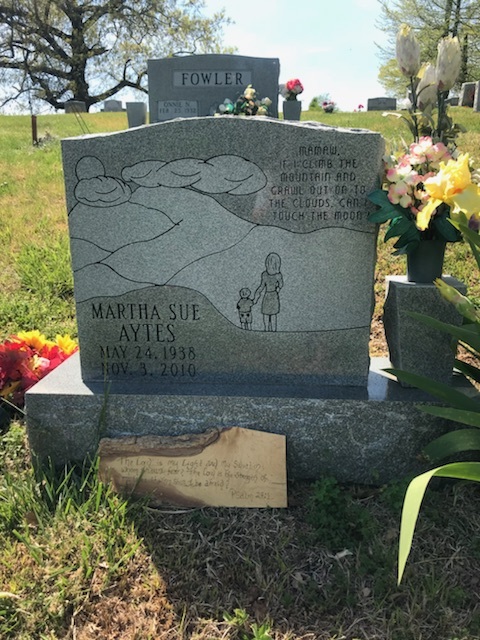 This last tombstone that I found at this cemetery was a very unique one! It belongs to Martha Sue Aytes who lived from May 24th, 1938- November 3rd, 2010. 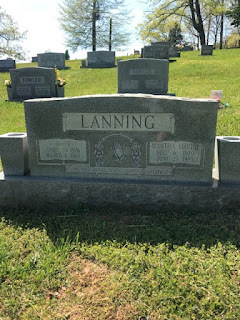 It has a mother holding a little boy's hand while looking up at the clouds. Then, in the sky, it says, "Mamaw, If I climb the mountain and crawl out on to the clouds, can I touch the moon?" This is a metaphor for reaching for the stars and having a big imagination. Lastly, on the wooden plaque, it says, "The Lord is my light and my salvation; whom I shall I fear? The Lord is the strength of my life; of whom I shall be afraid? Psalm 27:1" I personally love this bible verse because I have always heard this from my parents and it gives me the strength to do things I thought I could not do before. 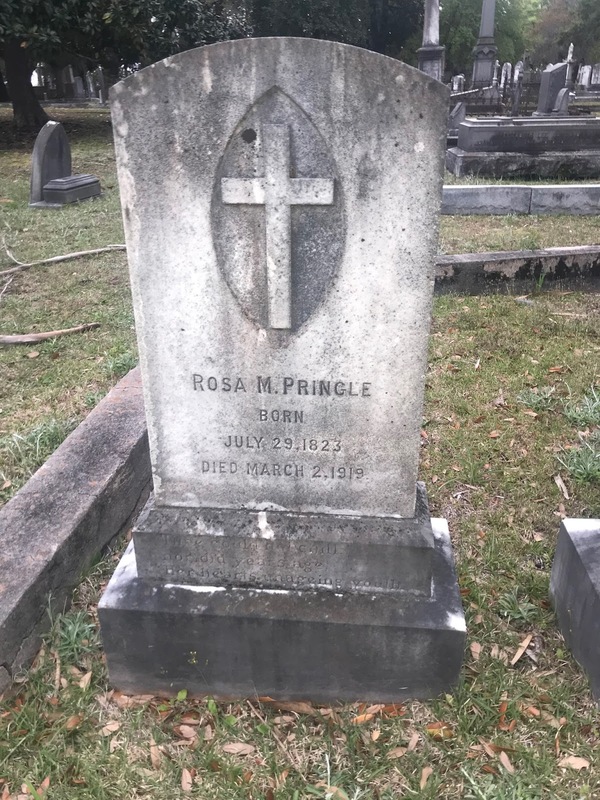 These next six tombstones come from the Magnolia Cemetery! 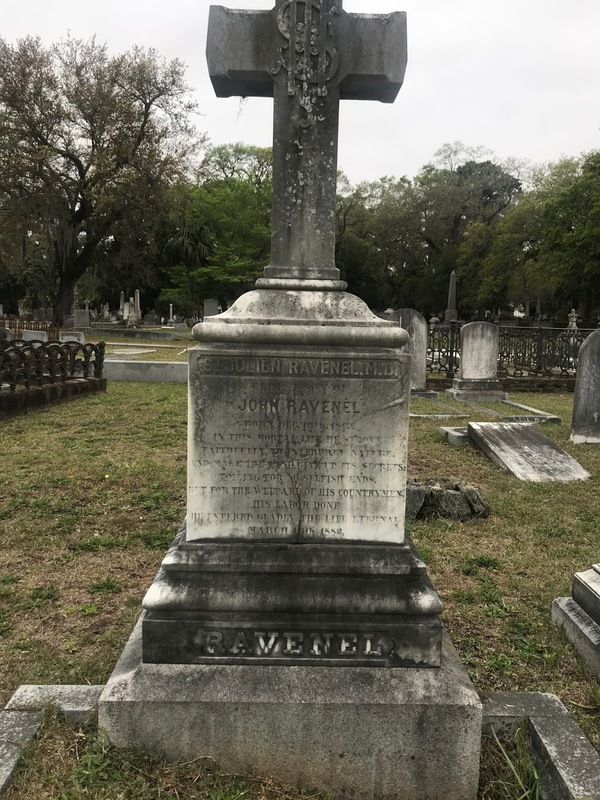 This first monument belongs to John Ravenel and says, "In this mortal life he strove, faithfully to interpret nature. And make the band give up its secrets: Toiling for no selfish ends. But for the welfare of his countrymen. 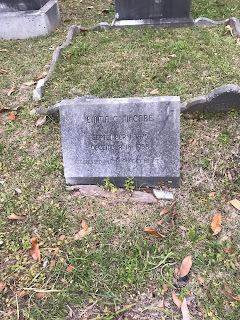 His labor done, he entered gladly the life eternal, March 16th, 1882." This epitaph just expresses how much of a wonderful person John Ravenel must have been and that he entered heaven happily! I wish I could have met him! 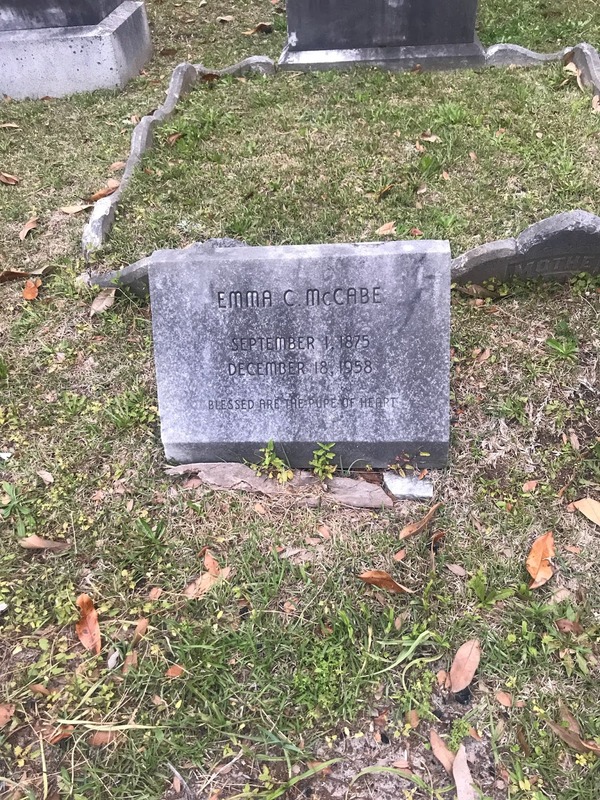 This next grave belongs to Emma C McCabe, who was born on September 1, 1875 and lived until December 18, 1958. On the bottom of this bevel marker, it says, "Blessed are the pupe of heart." I think this must be a typo actually because the word "pupe" does not exist. After doing some research, "best are the pure of the heart" is the bible verse Matthews 5:8.....maybe they were going for that????? 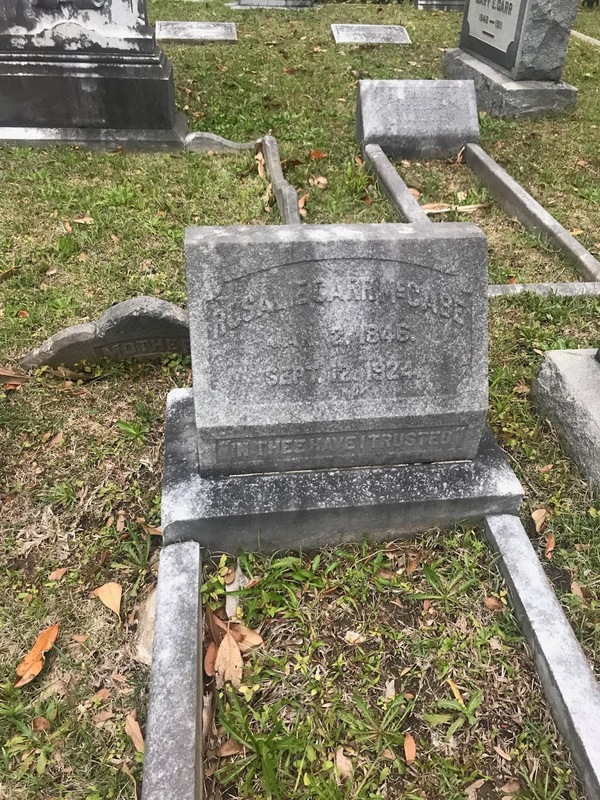 Next, we have a cradle grave which belongs to Rosaliecarr McCabe, who lived from Jan. 2nd 1846-Sept. 12th 1924. On the bottom of the cradle grave it says, "In thee Have a Trusted" which comes from a song by Georg Friedich Handel. This song talks about trusting the lord in order to follow him properly. 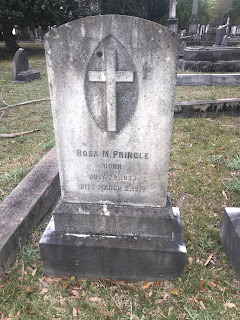 This next headstone belongs to Rosa M Pringle who lived from July 29th, 1823-March 2nd, 1919. On the bottom of the tombstone it says, "Time Could Not Chill. Nor Did Years Age. Her Hearts Unageing Youth." This is a more common poem of the final occasion and just explains that time is not stopped, while years did not age, and that her heart has always been youthful. This is very sweet!